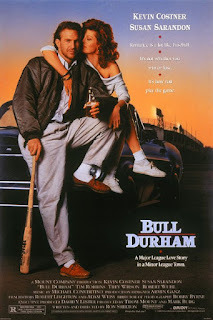 Our featured North Carolina film, 1988's Bull Durham, does have a movie church. It's just not Baptist or Catholic or Presbyterian or anything like those; it's the Church of Baseball. The Church's Apostle in the film is Annie Savoy (played by Susan Sarandon of Dead Man Walking), who tried a relationship with Jesus Christ but it didn't work out due to her "rejection of most traditional Judeo Christian values." Annie follows the minor league baseball club the Durham Bulls and "mentors" a new player every year. The film follows her as she decides between a young rookie pitcher (played by Tim Robbins) and a veteran catcher (played by Kevin Costner). Written and directed by Ron Shelton, the film is often ranked as one of the best sports films of all time. Though filled with ribald language and situations, I was glad that the Christian player on the team, Jimmie, proves faithful even when he marries one of Annie's disciples (it's sort of a Hosea situation.) The film is set in North Carolina with many mentions of travels to a variety of NC cities. It was filmed on location in the state. Also set and filmed in North Carolina was David Lynch's bizarre classic, Blue Velvet. Legend has it that when filming in a small NC town, the locals flocked to the location with lawn chairs to watch a real Hollywood production. And when a naked Isabella Rossellini arrived on the set for filming, most people packed up their chairs and left. A different kind of disappointment has been felt by many through the years who have rented Sandra Bullock's 28 Days and discovered it was not the zombie film 28 Days Later. If one is looking for horror films set and filmed in North Carolina, one could watch one of two Stephen King films featuring Drew Barrymore, Firestarter or Cat's Eye. Certainly avoid Maximum Overdrive about killer machines that was written and directed by Stephen King and which King himself admits was a disaster. Also set and filmed in North Carolina - the Civil War Drama Cold Mountain which was nominated for several Oscars and won the Best Supporting Actress Oscar for Rene Zellwiger. Another Oscar nominee set and filmed in the state was Jodie Foster's Nell. One of my favorite films that captured the feel of small town life in North Carolina is 2005's Junebug, which introduced Amy Adams to audiences in her first major film role.